Twisted Sister frontman Dee Snider’s newest grandchild was born Sunday afternoon on the 405 Freeway in Los Angeles, CA. 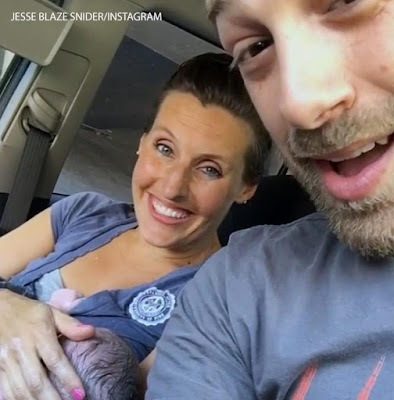 The rocker’s 33-year old son, Jesse, and wife Patty welcomed Parker Pryde Snider into the world while driving to the hospital. Jesse posted an Instagram video from his car alongside his wife, Patty, saying "We waited a little too long to leave." Proud grandfather Dee – in Germany to perform with Twisted Sister at the Wacken Open Air festival on Saturday – shared the news via a series of tweets. Parker Pryde is the fourth child for Jesse and Patty Snider, joining 7-year old daughter Logan Lane and almost 2-year old twin sons Cassidy West and Grayson Wayne. Jesse is the lead singer of the punk metal band Baptized By Fire. Dee and Twisted Sister are currently playing dates on their final tour, which will wrap up with a hometown farewell performance at Lakewood, NJ’s second annual Rock Carnival on October 1. The band’s new DVD, “Metal Meltdown”, just debuted at No. 1 on Billboard’s Music Video Sales chart. Directed by Brian Lockwood, “Metal Meltdown: Twister Sister Live At The Hard Rock Casino Las Vegas” presents the group’s May 30, 2015 concert at the venue where they topped a bill alongside Extreme, Great White and Skid Row. My 4th grandchild, a girl was just born...in the car on the way to the hospital! Welcome to the world Parker Snider! Way to get attention! Alright, Parker Pride Snider, 8lb. 10oz. delivered in the car on 405 Fwy BY THE MOM (Viking), Patty Snider while the dad @tweetjesse drove!